Doing things differently : RedBrick Pizza Cafe offers a variety of pizzas, including garlic chicken with mushrooms, arugula, tomato and red onions, and it features regular crust as well as whole wheat. Consider yourself warned. I am about to do the unthinkable and review a chain restaurant. Now before you get all worked up, let me say this: I know what you are thinking. I’ve been there before myself, looking down my nose at the crowds gathered outside chain restaurants. I even giggled when that restaurant critic in North Dakota reviewed The Olive Garden. Yet, it’s not food snobbery that keeps us from reviewing chains. Instead, this decision was born out of a desire to support local businesses. 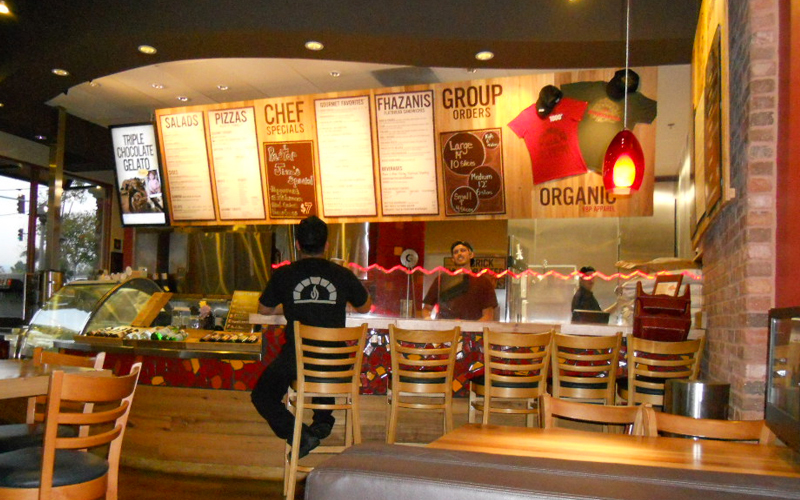 But when we heard about RedBrick Pizza — a chain with a conscience — we couldn’t resist breaking our own rule. When I stopped in for dinner on a recent Sunday night, this casual yet modern restaurant was bustling. Inside, there are a few long communal tables, a handful of seats at a bar overlooking the kitchen, some small booths (each complete with a small flat-screen TV), and a coffee table surrounded by four comfortable leather chairs. Within the first five minutes, assumption No. 1, chains aren’t cool, was dashed. It wasn’t too long after that assumption No. 2, chain restaurants would rather make a buck than do good for the environment, came crashing down as well when I noticed a large sign explaining all of the things this one does to minimize their impact on the environment. The restaurant uses LED lighting, nonpolluting paints and eco-friendly cleaning products. All of the tables in the restaurant are made from recycled wood, and all of the food containers and plates are made of a biodegradable and bio-compostable material that come from sugar cane. The menu at RedBrick is both tantalizing and overwhelming. There are pizzas in all different sizes and a variety of crusts to choose from. There are wines available by the glass or bottle, and a selection of beers brewed specifically for RedBrick available on tap.